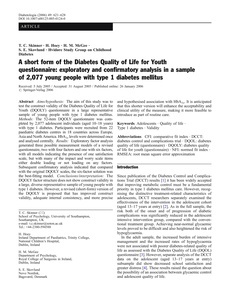 Aims/hypothesis: The aim of this study was to test the construct validity of the Diabetes Quality of Life for Youth (DQOLY) questionnaire in a large representative sample of young people with type 1 diabetes mellitus. Methods: The 52-item DQOLY questionnaire was completed by 2,077 adolescent individuals (aged 10� years) with type 1 diabetes. Participants were recruited from 22 paediatric diabetes centres in 18 countries across Europe, Asia and North America. HbA1c levels were determined once and analysed centrally. Results: Exploratory factor analysis generated three possible measurement models of a revised questionnaire, two with four factors and one with six factors, with all models indicating the presence of one satisfaction scale, but with many of the impact and worry scale items either double loading or not loading on any factors. Subsequent confirmatory analysis indicated that compared with the original DQOLY scales, the six-factor solution was the best-fitting model. Conclusions/interpretation: The DQOLY factor structure does not show construct validity in a large, diverse representative sample of young people with type 1 diabetes. However, a revised (short-form) version of the DQOLY is proposed that has improved construct validity, adequate internal consistency, and more precise and hypothesised association with HbA1c. It is anticipated that this shorter version will enhance the acceptability and clinical utility of the measure, making it more feasible to introduce as part of routine care.